2nd April 2009. Michelle's Trip to the Outback NSW Tourism Symposium & Blog, New ExplorOz Sandflag & QPA Titles, and a New Trek - Mungo National Park. This is our last newsletter before the Easter break - typically regarded as the start of the outback travel season. We are thrilled today to launch our new ExplorOz Sandflag Kit ideal for adventurous dune travellers needing the best flag/pole system on the market. Available exclusively through our online shop, this kit has been carefully put together by sourcing the best quality heavy duty telescopic pole on the market. From now until the end of April, we are also offering a "2 for the price of 1" offer for ExplorOz audiences via our GoDo Activities and Tours online booking service. This day-tour will appeal to anyone who has been longing to embark upon a sand dune 4WD experience to Stockton Beach but would prefer to be taken by an expert guide. Don't let this great offer slip by - if not for you, how about a gift certificate for a family member or friend? Meanwhile, Adele has sourced new titles from QPA which are now in stock. The new road atlas titledRoads and Tracks Australia continues the great work done in the WA version. There are also two new map books titledAustralia - States and Cities, and Mid West/South West WA. Michelle recently attended the Outback NSW Tourism Symposium held in Wentworth on 23rd - 24th March where we had been invited to operate an ExplorOz.com trade display. With a theme of "Partnerships in Tourism", the 2 day conference brought over 200 delegates from all sectors of the industry together with a common goal. As a media partner for the launch of the Darling River Run generated by the work of Outback NSW Tourism we hope to forge better relationships and understandings on a two-way level that ultimately helps travellers get a better experience. Michelle also combined a family camping trip throughout outback NSW and the Riverina in SA during her 9 day absence from the office, including a brief mapping survey and photographic tour of the Darling River Run, Mungo National Park, and sections of the Riverina and Murray River National Park that Damian is currently compiling into new Place references and Trek Notes. You can read all about Michelle's trip and see some of her photos in her Blog just published today. Click the trek notes below for ways to get to Mungo National Park. This ExplorOz sandflag has 2 mounting options for your bullbar. 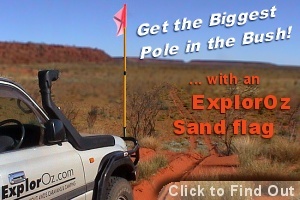 Book this fantastic tour through ExplorOz.com before the end of April and two people travel for the price of one. 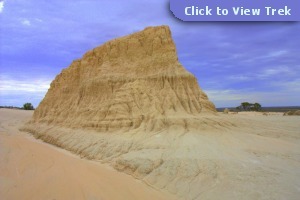 Click here for the: Stockton Beach Tour.